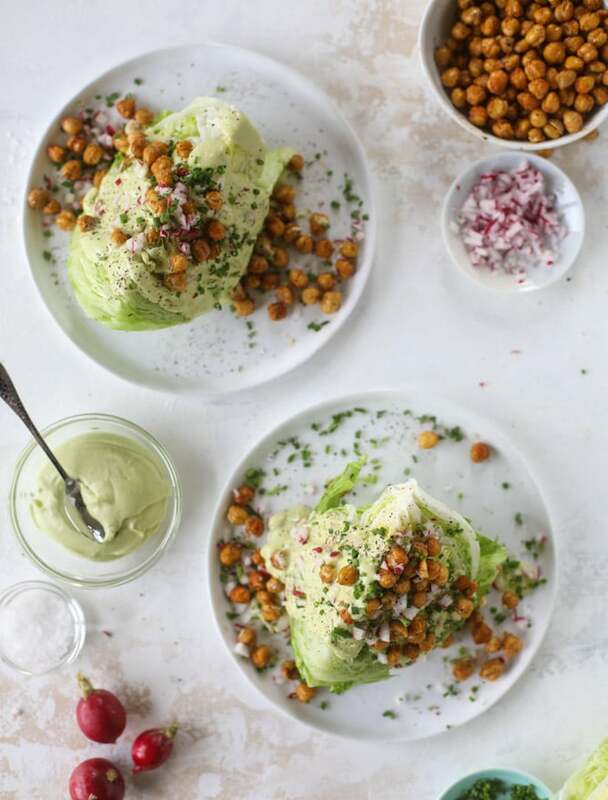 A crispy chickpea wedge salad is on the menu and it.is.perfection. Perfection, I tell you! I know that I might be in the minority, but I LOVE iceberg lettuce. Not necessarily in a sad chef salad (which always reminds me of school cafeteria food), but as a wedge or a lettuce wrap or something, I just find it super refreshing. And hydrating! And that crunch. Oooh that crunch. As a texture freak, it’s a must. So a wedge salad is something I’m all over. The layers that you cut through and crunch through. It’s just so good! The dressing gets in all the lettuce nook and crannies and it is just so delicious. I have no other words – it’s delicious. Here’s the thing. Of course, I’ll always be the first person to order the wedge with bacon and tomatoes. It’s a dream. But since I’m the predictable millennial who is always bored and must try new things? Well. I’m always going to try new things! And this salad is an amazing new thing! Okay okay, the crunchy chickpeas aren’t new at all. I’ve been making them for years! I make them to eat as a snack, to put on salads, to put in wraps – we just love them. So even though I practically consider it to be sacrilegious, I replaced crispy bacon with crispy chickpeas! They are so satisfying and filling that I knew I could actually turn this wedge into a full blown MEAL with them. A light, lovely summer meal. I mean… maybe with dessert? But anyway, I also drizzled on an avocado ranch. That’s not new at all either. I make it all the time! I don’t love regular ranch but I freaking adore avocado ranch. Weird stuff. Lots of fresh herbs on top too because it’s that time of year. I am soooo thrilled it’s that time of year. I’m practically using all my herbs already. Ooomph. Must grow more. And finally some diced radish. For a bite and for color. Because… hot pink. So here’s the thing. 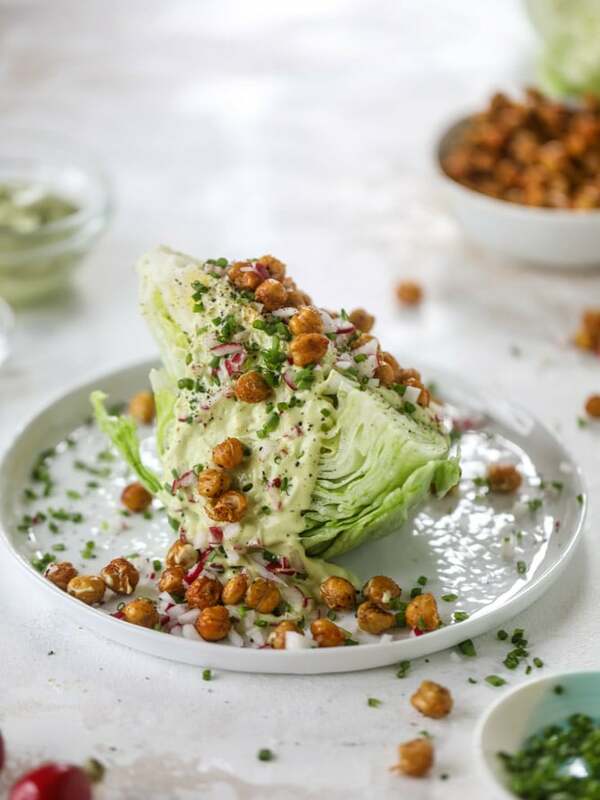 I have lots of recipes for the avocado ranch and lots of recipes that use crispy chickpeas. I suggest that when you plan to make this recipe, take a look at those other recipes and make them in the same week. That way, you can have extra avocado ranch for another weeknight meal (like these chicken skewers!) and chickpeas on another salad or in a pita or something. Double duty and no waste! Now isn’t this just a perfect Monday? All those exclamation points are deserved. Put the chickpeas on a baking sheet and drizzle with olive oil or the oil of your choice. Sprinkle on the salt, pepper, paprika and garlic powder and toss well to coat. Make sure the chickpeas are in a single layer. Bake for 15 to 20 minutes, toss well and flip, then bake for about 15 to 20 minutes more. This might make more chickpeas than you want to use - if so, keep them in a sealed container and you can reuse them! They will lose their crunchiness, but still taste delish. To assemble the salads, slice the head of iceberg into quarters. Place each on a plate and cover it with salt and pepper. Drizzle with the avocado ranch. Sprinkle on chickpeas, radishes and chives. Serve! Combine all ingredients in a food processor and blend until creamy, scraping down the sides occasionally when needed. Taste and season additionally if desired. Store avocado ranch in a seal-tight container for 1 to 2 days. Ohhh So perfect! I still remember the first time my family went to a fancy restaurant (I grew up in small town with none) and it had a wedge salad and we were all forever changed. This is perfect for summer! These look so incredibly good!! I had a lightbulb moment while browsing my blog feed this morning when I just KNEW I had to turn the cold chickpeas in my fridge into these crispy beauts for lunch today… and they were a hit! Served them on top of our regular go-to salad with a side of baked chicken drumsticks. Thanks for the inspiration! Iceberg is the best lettuce and I trust no one who says they don’t like it. Spinach and baby romaine don’t crunch like iceberg! I’m hosting a small retreat with some of my lady friends this weekend and this is totally going on the menu!! I made the wedge salad tonight to go with leftover olive focaccia. Delicious flavors and my daughter and I liked all the variety of textures. Those crispy chick peas are irresistible! Thank you!